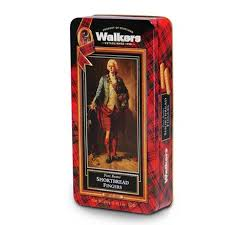 Soft, buttery biscuit made by world-renowned Scottish brand, Walkers. Traditionally eaten at Christmas and New Year but always a favourite at afternoon tea. This delightful gift box is decorated with an image of Bonnie Prince Charlie, one of the most tragic and romantic figures in Scottish history. Charles Edward Stuart, known as ‘Bonnie Prince Charlie’ or ‘the Young Pretender’, was born in 1720. He was the grandson of King James VII of Scotland and II of England, and he believed - along with his Jacobite followers - that the British throne was his birthright. In 1745 the Prince sailed from France and raised his flag at Glenfinnan, in the West Highlands, hoping to raise an army and overthrow King George II. He nearly succeeded. Sadly, after an eight-month campaign, King George's army obliterated what was left of the Prince's forces at the Battle of Culloden. Charles fled to Skye with the help of Flora Macdonald and was never to return. Wheat flour, butter (32%), sugar, salt. Contains: milk, wheat, gluten. Not suitable for nut allergy sufferers.